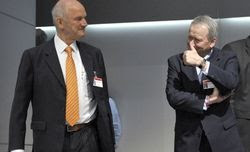 Stuttgart prosecutors have extended a probe into market manipulation during Porsche's failed bid to take over Volkswagen to all members of Porsche SE's supervisory board, including chairman Wolfgang Porsche and his cousin, Ferdinand Piech. All members of the 12-person board between March 2008 and October 2008, including labor representatives, are being looked at. Prosecutors are reviewing whether the board members aided former CEO Wendelin Wiedeking and finance chief Holger Haerter in market manipulation during that period, a spokesman for the prosecutors office said. The move follows a decision by prosecutors last December to charge Wiedeking and Haerter with market manipulation of VW shares during Porsche SE's botched 2008-09 takeover attempt of much larger VW. Porsche SE still faces civil lawsuits seeking more than 4 billion euros ($5.36 billion) in a Braunschweig, Germany, court over the issue. Porsche and its former executives have rejected the allegations. A New York court in December threw out a lawsuit by 26 hedge funds accusing Porsche of hiding a plan to corner the market in Volkswagen shares. The hedge funds agreed not to appeal the U.S. ruling after striking a deal with Porsche that allows them to sue in Germany. Following the victory in the U.S. case, the criminal investigation won't pose "a big danger" for Porsche, said Juergen Pieper, an analyst at Bankhaus Metzler. "This is the perfectionism that's being pursued to clear everything up," Pieper said. "The decisions have gone Porsche's way so far." In March 2008, Porsche SE dismissed as "speculation" talk that it intended to take over VW. Seven months later, Porsche SE said it controlled 42.6 percent of VW's common shares and held options for another 31.5 percent of the stock it had not disclosed previously. Porsche SE's statement caused VW shares to surge to 1,005 euros within days, briefly making VW the world's most valuable company as short-sellers raced to buy back stock they had borrowed to bet that VW shares would drop. Porsche SE racked up more than 10 billion euros of debt in its attempts to buy VW, pushing the company to near bankruptcy. Instead of buying VW, the company ended up selling its sports car business, Porsche AG, to VW. The Porsche SE holding company remains a stock-listed company, whose sole asset now consists of its 51 percent stake in VW.